A G Fox Wedding is held in downtown Hartford, Connecticut, in a building that has a rich historical background. The G. Fox and Co. Building is renowned for its architecture and downtown Hartford history. The building was founded as a small retail establishment in 1847 by Gershon Fox and his brother Isaac, and it then grew to become the city's largest department store of the twentieth century. The venue now is run by Marquee Events, the exclusive hosts to the Gershon Fox Ballroom and the Mezzanine lounge. The vibe of a G Fox Wedding has a contemporary yet vintage appeal. The venue promotes exclusive wedding packages are designed to be hassle-free and to offer a personal approach to planning out a magical day. This photograph shows a bride and groom standing at the center of an empty room in the famous building. The geometric shapes created by the ceiling give the space a sense of artistry and make the room feel isolated. 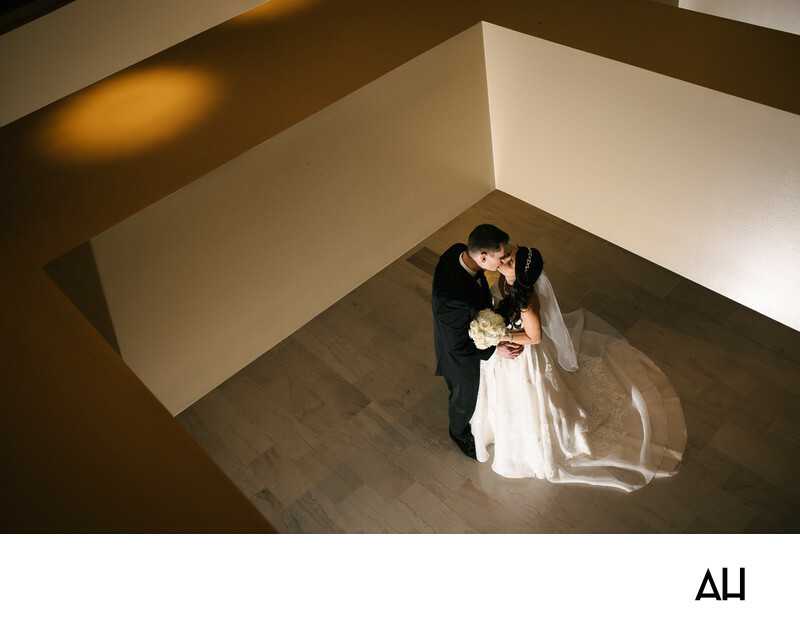 Shadows dance on the room’s walls and ceiling, but only light surrounds the newlyweds. I took the picture from above the couple to giving them some privacy and to create an image that gave the sense that the couple are completely alone. Looking down into the room, the bride’s bejeweled headband sparkles, holding her dark hair in place. Her hair tumbles in curls over her shoulder as she tips her head up to kiss her husband. A sheer layer of lace covers the bride’s ivory gown, giving it a vintage appearance, and the train of the dress fans out behind her. The groom is charming in a classic tuxedo, and the two create a picture that could have been pulled from another time.